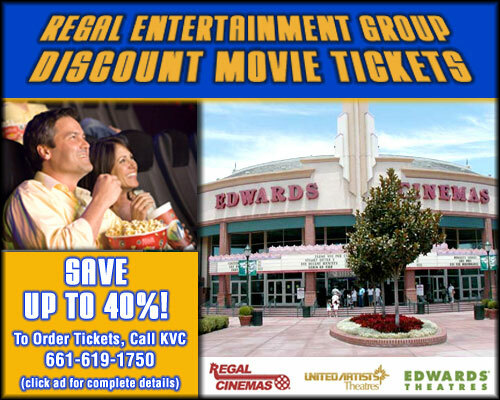 Discount tickets must be purchased in advance through Kern Value Card. You may NOT show your Kern Value Card at the admission gate to receive your discount tickets. Regal Entertainment Group Premiere tickets are honored at all Regal Cinemas, United Artists Theatres and Edwards Theatres nationwide. Tickets have no expiration dates. Premiere tickets are valid for all films and show times. They are not valid for special events, private screenings or online purchases. Premiere tickets have surcharge fees for all IMAX, Large Format, RPX or 3-D Films. Location surcharge fees may also be applied at select theatres. Regal Entertainment Group reserves the right to change any Upgrade, Surcharge or Location Surcharge fee without notice. Premiere ticket redemption at box office counts towards points on your Regal Crown Club Card. Ticket must be redeemed at box office. Premiere tickets must be purchased in advance through Kern Value Card. They are not available at theatre locations. Regal Entertainment Group is the largest motion picture exhibitor in the U.S. with over 540 theatre locations in 38 states. Visit www.regmovies.com for theatre locations and show times. Maya Cinemas megaplex movie theaters provide the highest quality movie-going experience. Maya theaters offer first-run Hollywood movies, and in one screen specialty and Spanish language films, utilizing state-of-the-art technology and providing first-rate entertainment with superior customer service and luxury seating.